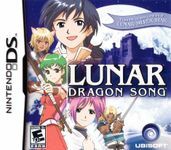 "Lunar: Dragon Song, known in Japan and Europe as Lunar Genesis (ルナ-ジェネシス-, Runa Jenesisu), is a role-playing video game developed by Japan Art Media for the Nintendo DS handheld console. The game was originally released in Japan by Marvelous Interactive in August 2005, with an English language version made available in North America by Ubisoft Entertainment the following September, and a European version in early 2006 by Rising Star Games. As the first original Lunar series title in ten years, it was also the first traditional role-playing game available for the Nintendo DS, utilizing several new features such as combat taking place across of two screens and the use of the system's built-in mic to issue commands." Source: Wikipedia, "Lunar_Genesis," available under the CC-BY-SA License.